Ruby of the Nile Video Slot Review - Casino Answers! 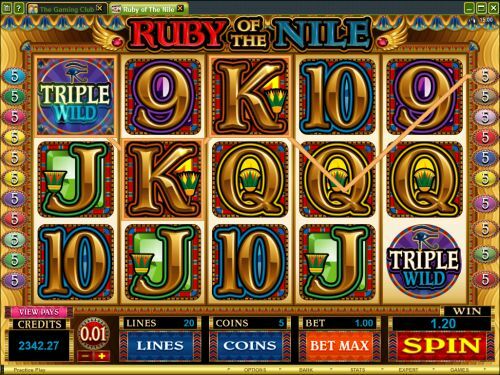 Ruby of the Nile is a 5-reel, 20-line video slot developed by Microgaming, featuring wild multiplier symbols, scatter wins, multipliers and a free spins feature. You can play the Ruby of the Nile video slot at Bovada. Ruby of the Nile is a penny slot. Coin sizes on the Ruby of the Nile are $0.01, $0.02, $0.05, $0.10, $0.20, $0.25 and $0.50. You can select up to 20 paylines at 1-5 coins per line. You can bet anywhere up to the maximum total bet of $50 per spin on the Ruby of the Nile video slot. Ruby of the Nile has a decent betting range that should suit most online slots players. Hit the “Stop” button to activate the skill stop feature on the Ruby of the Nile slot machine. To play the Ruby of the Nile slot game, select your bet and press “Spin.” To play all 20 lines at 5 coins per line, hit the “Bet Max” button to spin the reels. Ruby of the Nile features five scatter symbols. The highest paying symbol on the Ruby of the Nile online slot machine is the Logo symbol. If you hit 5 Scattered Logo symbols anywhere on the reels, you will win 100X your total bet. If a Triple Wild multiplier symbol substitutes in a winning combination, you can win 300X your total bet from this winning combination. Other scatter symbols that can be affected by the wild multipliers include the Cleopatra (up to 240X your total bet) and Horus and Anubis (up to 225X) symbols. The Double Wild and Triple Wild symbols are both wild multiplier symbols. They will both substitute for all other symbols on the Ruby of the Nile video slot except for the Scattered Treasure Chest symbol. The Double Wild symbol will multiply your winnings by 2X when substituting. The Triple Wild will multiply your winnings by 3X. Only the highest wild multiplier will be awarded per spin. Use these wild multiplier symbols to win big on the Ruby of the Nile slot game at Bovada! When the Scattered Treasure Chest symbol appears in the muddle of reel 5, you will win up to 20 free spins at a 2X multiplier. The free spins feature can be re-triggered. All bets and lines played are the same as the spin that triggered the free spins feature. Ruby of the Nile has an autoplay feature with advanced settings. To use the autoplay mode on the Ruby of the Nile online slot machine, you must hit the “Expert” button. You can now play 5 or 10 autoplay spins. For advanced settings, hit the “AutoPlay” button and you can now play 5, 10, 25, 50, 100, 250 or 500 autoplay spins and stop autoplay if a win exceeds or equals $100, $500, $1000, $5000 or $9999. Autoplay will stop on any feature contained in the game. You can stop autoplay at any time on the Ruby of the Nile slot game. As mentioned above, the Ruby of the Nile slot game has lots of scatter symbols that keep things interesting. Its wild multipliers will actually multiply most of the scatter wins. You can play the Ruby of the Nile online slot machine when you sign up today at Bovada. Can USA players play the Ruby of the Nile casino game for real money? No, players from the United States cannot play the Ruby of the Nile slot game for real money. For more Egyptian-themed video slots (many of which are USA-friendly), please read our complete list of Egyptian slots. Where can I find a free flash game of the Ruby of the Nile video slot? 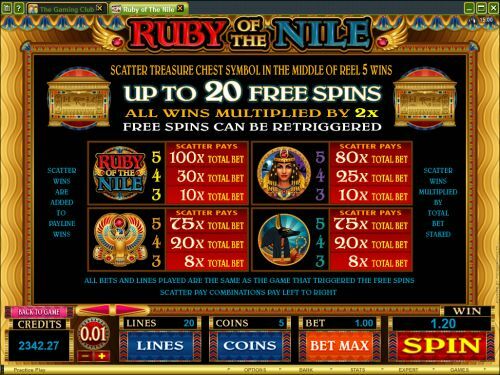 The Ruby of the Nile slot game is new at press time and therefore is not currently available at Microgaming flash casinos. If you keep checking back at Bovada, it should be added to the instant play casino soon.